The Shotgun engine for Mari provides a bridge between the Mari application and Shotgun through the Shotgun Pipeline Toolkit. 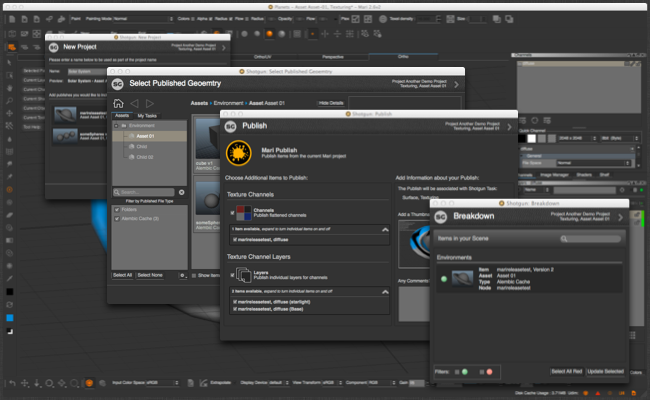 The engine uses metadata in Mari to help track projects, geometry and geometry versions. Together with the loader, breakdown and publish Multi-apps, it helps integrate Mari seamlessly into the rest of your pipeline. This item has been tested and is known to be working on the following application versions: 2.6 - 4.2. Please note that it is perfectly possible, even likely, that it will work with more recent releases, however it has not yet been formally tested with these versions. We're currently working on the docs for this engine but in the mean time, if you have any questions, please contact toolkitsupport@shotgunsoftware.com. If you have access to the Shotgun Pipeline Toolkit, you also have access to the source code for all apps, engines and frameworks in Github where we store and manage them. Feel free to evolve these items; use them as a base for further independent development, make changes (and submit pull requests back to us!) or simply tinker with them to see how they have been built and how the toolkit works. You can access this code repository at https://github.com/shotgunsoftware/tk-mari. Ups maximum supported version to 4.2. Ups maximum supported version to 3.4. Ups maximum supported version to 3.3. Better handling of PythonQt import issues in Mari 2.x. Handles metadata requests in Mari 2.x properly. When in an empty session of Mari 2.x, it's often the case that referencing the geo and project entity classes fails with an AttributeError. This is now handled appropriately during get_metadata calls. Better handles metadata requests and updated icon. When requesting SGTK metadata from the engine, if there are no active projects in Mari an empty dictionary is returned. Previously this would have resulted in an unhandled AttributeError being raised. Adds support for Mari 3.0. I was wondering if anyone could point me to where the code for the whole 'round trip' for Mari to Maya lives. I want to try and implement something similar for Softimage.